Gard PUR 60 specially developed cleaner for cured and non-cured PUR adhesives. 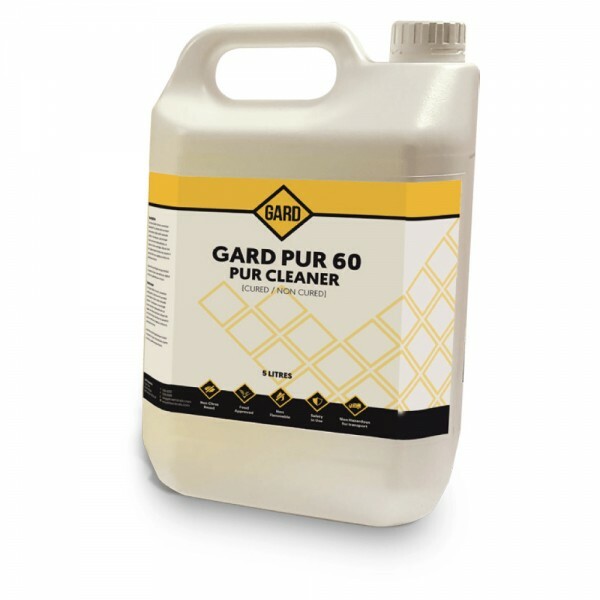 Gard PUR 60 will remove PUR residues from roll coaters, tanks etc and is operator safe and environmentally friendly. Gard Chemicals are specialist formulators and manufacturers of adhesive cleaner and release agents for both hot and cold glues. Gard PUR 60 will remove PUR residues from all roll coater applications whilst still on the machine and condition rollers for extended life span. All parts can be cleaned very effectively in a heated tank /fryer application at 170°C (338°F). Strip down the components which need cleaning. Immerse / Soak into a small heated tank. Heat the solution of Gard PUR 60. Immerse the parts in the heated solution (170°C). Allow to sit for approx. 15 – 20 minutes. If after the above time residue still remains then repeat points 4 and 5 above. What you will find with the above application / method is that the PUR adhesive is turned to a jelly and any residue is easily wiped away. When cleaning off in situ on uncured PUR adhesive then its simply a case of applying GARD PUR 60 and wiping the surface down with a clean cloth.